Honda recently updated their popular offering, the Honda City with the ZX MT variant in response to the high demand from the customers. 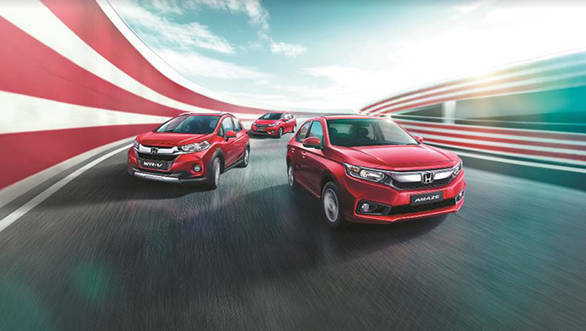 Honda cars India limited have a similar strategy lined up for the Amaze, Jazz, and the WR-V by offering them in an 'Exclusive' form to make it more appealing to their customers. The Japanese car makers have launched the exclusive editions of the Amaze, Jazz, and the WR-V for the price of Rs 7.86 lakh, Rs 9.22 lakh, and Rs 9.35 lakh ex-showroom respectively. This exclusive update is essentially a cosmetic upgrade over some select model of the hatchback, the crossover, and the sub-compact sedan. The Exclusive edition will only be made available in the Jazz CVT petrol although the WR-V and the Amaze will get it in the VX MT petrol and diesel. The updated cars will not roll off the assembly-line but instead will be treated at the dealership level by adding accessories. However, the accessories will be dispatched from the factory and will be fitted on the car at the dealership. On the outside, the Jazz CVT will be updated with blacked out alloy wheels which will come fitted from the factory, and side body graphics. The hatchback will also be equipped with a gloss black spoiler painted by the dealers. Interior of the car will include illuminating door sill with branding and premium seat covers. The Amaze VX MT will be updated with illuminating door sills with branding, gloss black wheel caps, exclusive seat covers, and an arm-rest with a sliding cover for the storage compartment. Similarly, The WR-V VX MT will be updated with illuminating door sills, premium covers for the seats, sporty graphics, and a gloss black rear spoiler painted by the dealer. All the models will carry an 'Exclusive Edition' badge on the rear and will be sold in only in the colour Radiant Red and White Orchid Pearl. The Exclusive Edition package gives these cars an edge over their rivals and the manufacturer could expect a hike in the sales numbers of the mentioned cars. That said the company hasn't updated the Honda Brio and could probably pull discontinue making the Honda Jazz the most economical option in Honda's portfolio. 2019 Honda Amaze VX MT Petrol - rs 7,86,900. 2019 Honda Amaze VX MT Diesel - Rs 8,96,900. 2019 Honda WR-V VX MT Petrol - Rs 9,35,050. 2019 Honda Jazz CVT Petrol - Rs 9,22,900.